You must activate the Auto-Save feature in DesktopOK , and it does not matter whether it is, Windows 10 or Windows 8.1 or Windows 7! 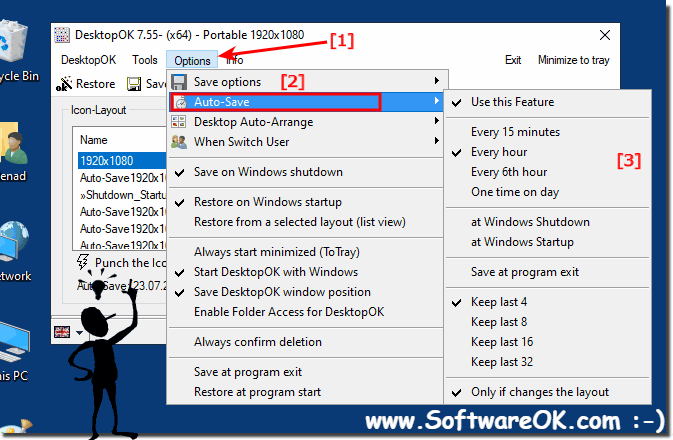 Easy use the Auto-Save feature in Desktop-OK on all Windows Desktop and Microsofts Server Operating Systems! 1.) ... Activate auto save desktop icons feature. 2.) ... If you rename the auto save entry. 1.) Activate auto save desktop icons feature. (Image-1) Activate Auto-Save Windows Desktop-Symbols! 2.) If you rename the auto save entry. The program will the Auto-Save record, no longer see as the Auto - Save entry! I have set it to "Keep last 4" but it does not do so! This Desktop Icon Save Tool is a small tool that adds a missing function to Windows. The application stores the arrangement of the icons on the desktop. The times when the program icons were abandoned in the usual order when changing the screen resolution are thus a thing of the past. Depending on the setting, This Desktop Icon Save Tool for Windows automatically saves the self-defined arrangement of the program icons in Windows. The software allows a quick rearrangement of the icons according to the created profile or the quick restoration of a desired state via the context menu (right mouse button on the desktop). This benefits computer users in particular, who often have to change their screen resolutions, or groups who need to share a PC with just one set up Windows profile. DesktopOK - FAQ-9: I have set it to 'Keep last 4' but it doesn't so autosave the icons! It is very easy to switch / change the Language in DesktopOK to English or to Other Language. Is the same version or download. Please start the DesktopOK. Would it be possible to install a feature in DesktopOK which the desktop icon arrangement also automatically, for. B. every 5 min., Or synonymous freely selectable stores? It should then be possible to choose whether the last stored data overwrites, so should be replaced or not ... that would be great if you could realize that, because I too forget to do manual storage every now and then !? Related Software to Auto-Save and Enable / Use Keywords to Match the Desktopicon Position? Auto desktop icon layout Windows save 10? Automatically under Windows 10 saves desktop window layout? Windows 10 automatically save the ICOM locations and size? How do I automatically save my desktop icon layout in Windows 10? Save and restore desktop icon with auto function?